Unless they are well-established in niche products, smaller companies in Germany are expected to continue to be the losers in a cut-throat environment. 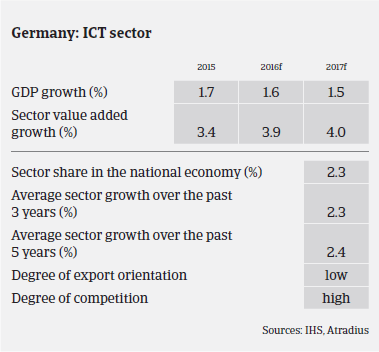 ICT plays a pivotal role in the German economy, employing more than one million people and having generated about 130,000 new jobs over the past five years. According to the German Federal Association for Information Technology, Telecommunications and New Media (BITKOM), overall consumer electronics/ICT sales increased 2.9% in 2015, to EUR 157.6 billion. This positive trend is expected to continue in 2016, with a 1.7% growth rate forecast. While turnover in the consumer electronics and telecommunications segments is expected to increase only 2%, IT sales (IT hardware, software and services) are forecast to increase 3%. Within this segment, software sales (up 6%) are expected to be the main driver of growth. 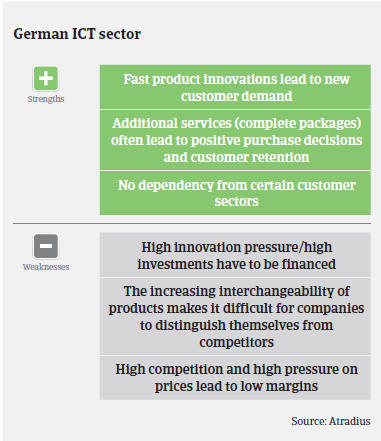 Despite continued sales growth, businesses in the German ICT sector are exposed to some challenges: in general, businesses in all subsectors (IT, telecommunications and consumer electronics) have below-average equity strength. Profit margins are tight because of fierce competition, particularly on price. As the German ICT market is dominated by a few big groups but characterised by a high number of mid-sized companies, there is a high level of competition on all levels. The low margins, sharp price erosion and fierce competition lead to an on-going trend of consolidation. Unless they are well-established in niche products, smaller companies are – and will continue to be – the losers in this cut-throat environment. Due to fast changing technology in this industry and low margins, the wholesale and retail of electronic appliances segment is especially susceptible to fraud. On average, payments in the ICT industry take between 30 and 60 days. 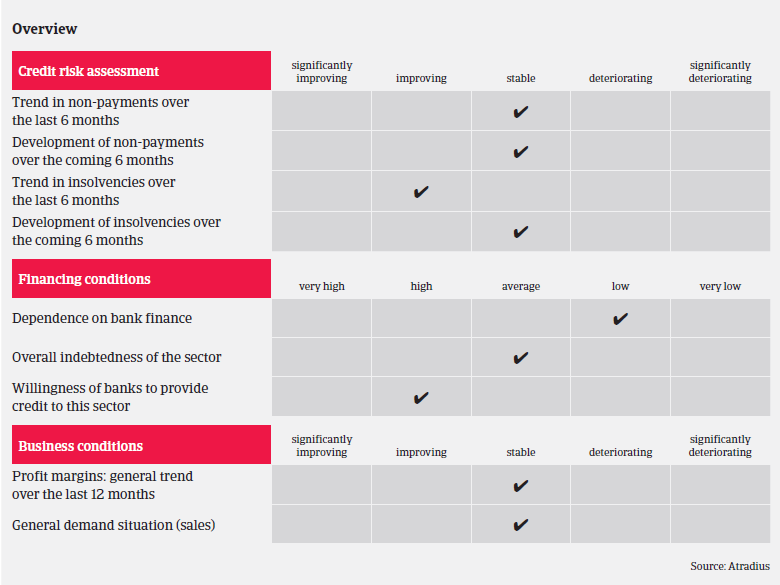 We have seen no increase in payment delays over the past couple of months, and we expect this to remain unchanged. According to BITKOM, in 2015 ICT insolvencies decreased 7.8% year-on-year after an increase of 4.7% in 2014. Insolvency levels have sharply increased in the consumer electronics segment, where competition is most fierce and price wars are permanent. In 2016, we expect ICT insolvencies to level off, in line with the overall business insolvency trend in Germany. In general, our underwriting approach for the ICT industry remains open, as the sector is expected to continue growing in the coming years. But as ICT is a very fast and innovative industry with sharp price erosion and high competition, we require comprehensive information on each company we underwrite. If we are to cover, we need to have the most recently available insight into the company’s financial and business performance. Additionally, we are more selective on ICT businesses operating for less than one year, unless they are part of a larger group or spin-off.